Jim Boeshans (Business Manager), Neil Bolding (Technical & Quality Manager) and Ryne Reuvers (Sales Manager). We were all able to attend the expanded 2 days of technical seminars and meet with the attendees during the social net working times. This year many new companies were in attendance and it gave us the opportunity to discuss our industrial films and screen printing materials in greater detail for printed electronics applications. 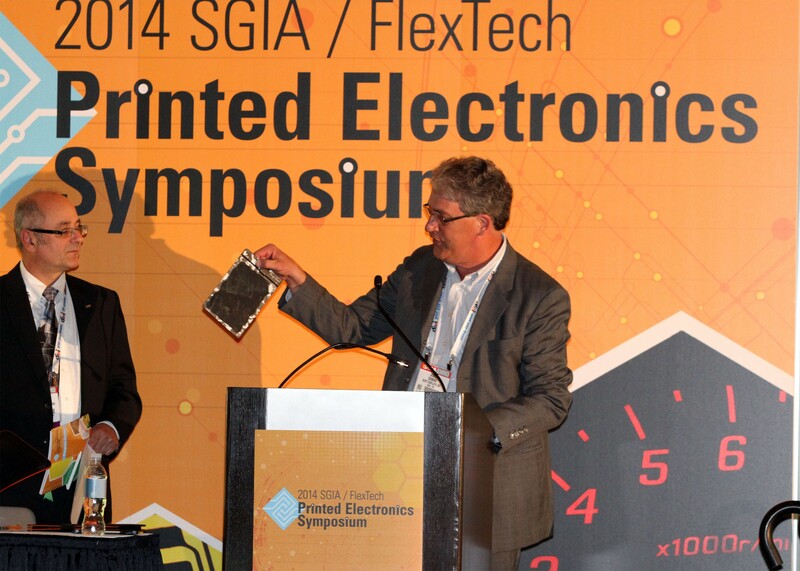 Image below: Neil has been the SGIA chairman of the printed electronics committee for a number of years and moderated the first day of the symposium on behalf of the SGIA. Image of Neil (left) with Joel Domino, CEO of Kent Displays. This entry was posted in Company, Shows and tagged Industrial Films, Screen Printing, SGIA. Bookmark the permalink.